Portrait of Galileo Galilei painted in 1636 by Justus Sustermans. Today, Saturday, 2014 February 15, marks the 450th anniversary of the birth of one of history's most preeminent astronomers, Galileo Galilei. One of the first scientists to use a primitive telescope to look at objects in the sky was born 1564 February 15 and died 1642 January 8. The Italian scientist was much more than an astronomer. He was also a physicist, mathematician, and philosopher who defended the Copernican model of heliocentrism, with the Sun at the center of the Solar System. From this defense, Galileo was found "vehemently suspect of heresy" by the Roman Catholic Church, which led to house arrest for the rest of his life after recanting his heliocentric views. * Confirmation of the phases of Venus (similar to phases of the Earth's Moon). * Discovery of the four largest natural satellites of Jupiter (named Galilean Moons in his honor). * Observation and analysis of sunspots on the Sun. * First observed the rings of Saturn, although his primitive telescope did not permit him a proper explanation of the phenomenon. * First observed Neptune, but the brief observation did not permit him to understand it was a planet, although he did notice an unusual motion relative to the stars. * First to correctly interpret the light and shadows on the Moon as lunar mountains and craters. * First to realize that the Milky Way was really a multitude of stars packed so densely together to appear as a cloud without use of a telescope. * First to see stars not visible to the naked-eye, including a double-star, Mizar in the Constellation Ursa Major. * One of the first scientists to use a telescope to view celestial objects. 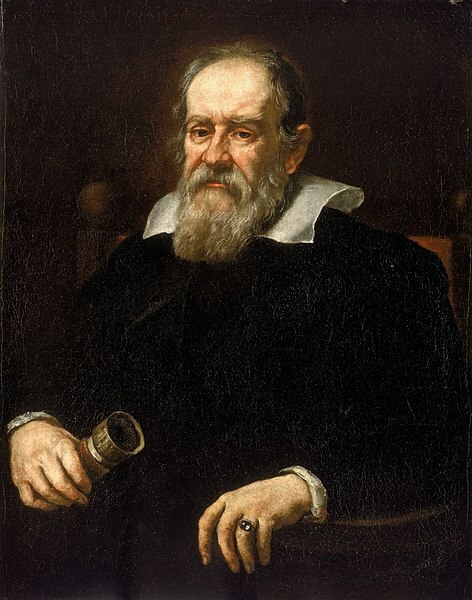 The term "telescope" was coined by a Greek mathematician at a banquet where Galileo was inducted into the Accademia dei Lincei (Italy's first science academy). * Invented a microscope. Again, the term "microscope" was coined for Galileo's invention by a fellow member of the Accademia dei Lincei. * Invented improved military compass. * Invented a thermometer, using the expansion and contraction of air in a bulb to move water in attached tube. 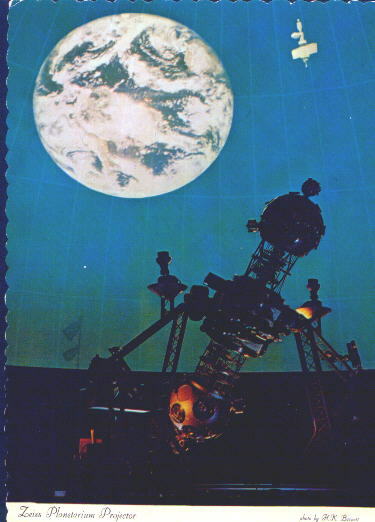 A theatrical play on the life of Galileo was part of a unique collaboration, a five-part, year-long Galileo Project, between Pittsburgh's original Buhl Planetarium and Institute of Popular Science and the Pittsburgh Public Theater in the Summer of 1981. "Galileo" by Bertolt Brecht (directed by J. Ranelli) was performed, from 1981 June 24 to August 2, in two neighboring venues - half the performance in one venue and the second half in the second venue. The first venue was the theatrical stage in the Theater of the Stars of Pittsburgh's original Buhl Planetarium and Institute of Popular Science, the first permanent theatrical stage in a planetarium theater. Next-door, the second venue was the Hazlett Theater in Carnegie Hall (the world's first Carnegie Hall, which opened a year before the more famous Carnegie Hall in New York City), adjoining America's first publicly-funded Carnegie Library, which at that time was the home to the Pittsburgh Public Theater (since 1999, the Pittsburgh Public Theater has performed in the newer O'Reilly Theater, located in Downtown Pittsburgh's Cultural District). In the mid-1980s, the author, Glenn A. Walsh, found a stage-prop used as Galileo's telescope in the play (as well as a stage-prop hat designed to look like a hat worn by a gentleman during Galileo's era) in a Buhl Planetarium storage room (which had once been used as a Sound Room for Buhl's 1939 state-of-the-art "talking exhibits," which used record turntables for the audio). From then-on, until the closure of The Buhl Planetarium and Institute of Popular Science building (a.k.a. Buhl Science Center) as a public museum in August of 1991, the Galileo telescope prop was displayed to the public in Buhl's Astronomical Observatory. Sources: Wikipedia.org , Glenn A. Walsh Reporting for SpaceWatchtower, a project of Friends of the Zeiss. What is Galileo is doing tonight? My hope would be that the great man is resting in peace and that his head is not spinning in his grave. How, now, can Galileo possibly have peace? So few scientists speak out clearly and loudly regarding whatsoever they believe to be true about at least one root cause of the distinctly human-driven global predicament looming so ominously before humanity: human population dynamics/overpopulation of Earth. The human community could soon be confronted by multiple global ecological threats to future human wellbeing and environmental health that appear to result directly from the unbridled overproduction, overconsumption and overpopulation activities of the human species now overspreading the Earth and threatening to ravage the planetary home we are blessed us to inhabit? Many too many leaders and a predominant coterie of the 'brightest and best’ experts are choosing to remain silent rather than acknowledge science. Please consider how the elective mutism of so many of the most fortunate and knowledgeable elders among us could be contributing mightily to the ruination of Earth and its environs as a fit place for human habitation. Where are the intelligent leaders and established professionals with appropriate expertise who will stop colluding in silence, who are willing to examine and report on science that exists in the form of solid, uncontested research? Look at the dismaying disarray in which we find ourselves now and how far we have to travel in a short time to move the human family away from precipitating some unimaginable sort of global ecological wreckage. What would the world we inhabit look like if scientists like Galileo had chosen not to disclose science and instead adopt a code of silence? In such circumstances Galileo as well as scientists today would speak only about scientific evidence that the super-rich and most powerful people of the day believe to be politically convenient, religiously tolerable, economically expedient, socially correct and culturally prescribed. By so doing, Galileo and modern-day scientists would effectively breach their responsibilities to science and duties to humanity to tell the truth as they see it, as best they can report it. Heretofore hesitant and inert scientists are called upon now to follow the good example of Galileo. The politically correct silence of so many knowledgeable but apparently dumbstruck experts on one hand as well as the incessant mass media jabber of sycophants and other minions of wealthy power brokers on the other hand could be killing the world we inhabit as well as life as we know it. Most scientists have not actively engaged in inimical ‘sins of commission’, as have many too many deceitful, chattering experts; and yet too many scientists on our watch have chosen to maintain their silence by not speaking out ‘as if each one was a million voices’. It appears scientists have been and continue willfully to deny the best available scientific evidence that specifically relates to human population dynamics. Is their collusion to remain electively mute correctly described as a sin of omission or a lie of silence? If science does not overcome silence, then much of the world the human community believes we are preserving and protecting will be irreversibly degraded and relentlessly dissipated, if not destroyed outright. Surely, truthful empirical reports from intellectually honest and moral courageous scientists regarding the population dynamics of the human species and the human overpopulation of Earth will give Galileo Galilei peace.